In mid 2009, Google started their initiative for a faster internet “Let’s make the web faster”. This laid the foundation for another (new) ranking factor. We focus on speed as a key requirement in product and infrastructure development, because our research indicates that people prefer faster, more responsive apps. Instead of focussing solely on their own products and services, Google encouraged webmasters worldwide to reflect on their PageSpeed, the loading speed of their website. Just one year later, they confirmed that the PageSpeed would be added as another one of their roughly 200 ranking-factors. webmaster should pay attention to a fast delivery of their website’s content for the benefit of their own users and therefore optimise the loading times for their website. 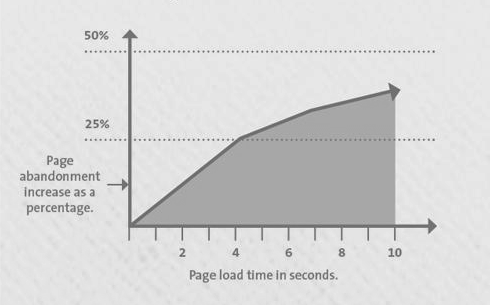 Research has shown that the satisfaction of a user decreases 16% for every second of elapsed loading time. With a loading time (of the site) of 4 seconds, 25% of users will immediately leave the website again. It is therefore recommended to keep an eye on the PageSpeed of your website and optimise it, if necessary. How is the PageSpeed of a website measured? Google mainly uses the Google toolbar data to measure the PageSpeed. This way, they can measure the average connectivity of a website for all users with different internet connections and speeds. A website does not necessarily have to have slower loading speeds because of large pictures or many lines in the HTML source code, the connection of the webserver could also be the crucial factor, among others. In order to also include such possibile influences, Google uses the toolbar data. Browsing the web should be as fast as turning the pages of a magazine to enable the next generation of rich web applications.